LIQUID GOLD is a premium two component polyester filler paste used for the filling of holes and imperfections in most substrates. The LIQUID GOLD formulation uses sophisticated lightweight technology to produce excellent filling properties combined with smooth application and very easy sanding. 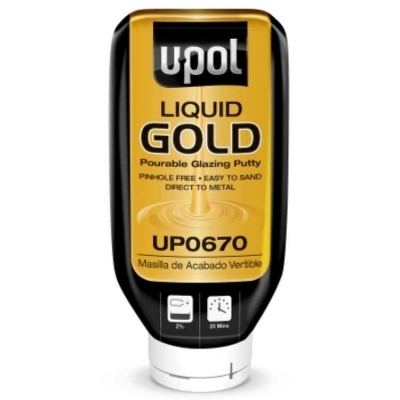 If so desired, LIQUID GOLD may be mixed with U-POL’s FLYWEIGHT GOLD to adjust the product’s viscosity. It has been designed with the most challenging professional applications in mind. Smooth and easy to sand. Impervious to solvents in 15-20 minutes. Can be sanded and painted in 15-20 minutes. New package allows for less waste.